Even if you haven’t studied early 19th century history, you have certainly heard of Napoleon and Josephine. Napoleon Bonaparte was the Emperor of France from 1804 until 1814 and the builder of a new nation after the French Revolution. 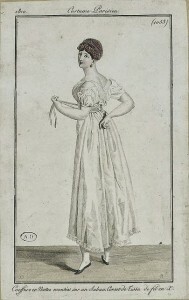 Josephine was his beloved wife. Recently I was honored to be commissioned to make clothing for the Empress herself. Actually, of course, I was not sewing for Josephine, but for a lovely modern woman who would portray her. 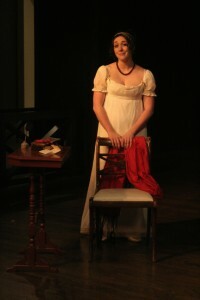 Victoria Reibel is an interpreter and actress at the Frazier History Museum in Louisville, Kentucky. Kelly Moore, the Museum’s Outreach Liaison, contacted Lavender’s Green for a proposal on what she should wear for the program. Before I design a gown, I like to understand the context: where will it be worn, for what audience, and to tell what story? Josephine’s public performance would portray her a few evenings before Napoleon’s and her own coronation in 1804. This interpretation was not to be a formal speech, but an “evening in the parlor” situation. 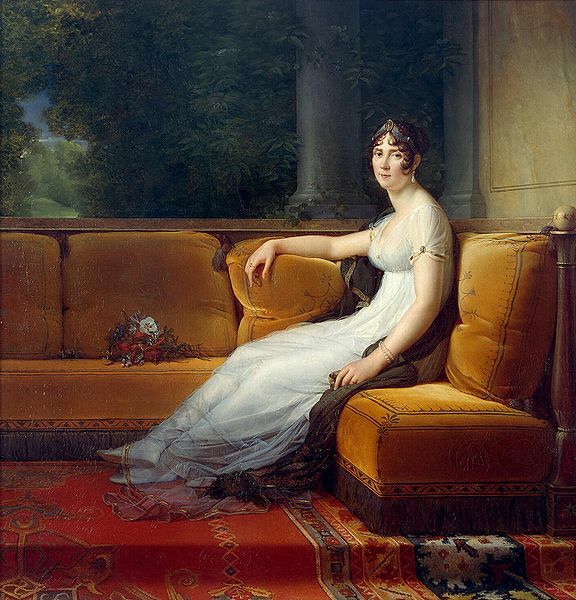 Josephine would talk to the audience about her life, her relationship with Napoleon, and the impending coronation. 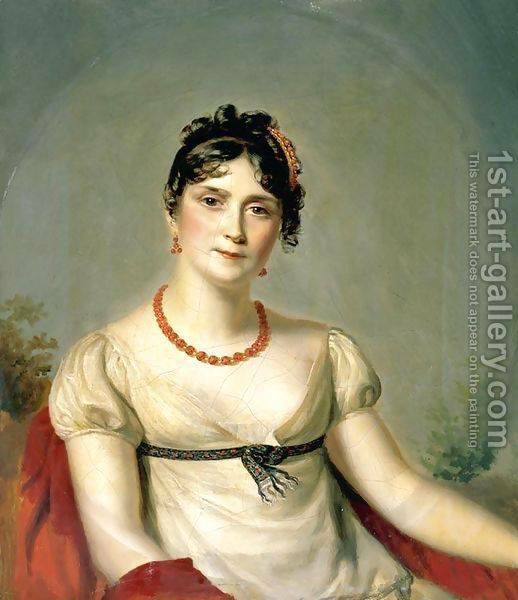 Many of the contemporary portraits of Josephine display her creamy skin and lovely figure. 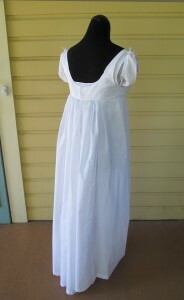 She was pictured in the fashionable thin white cotton gowns of the Empire period, a style that she wore extremely well. 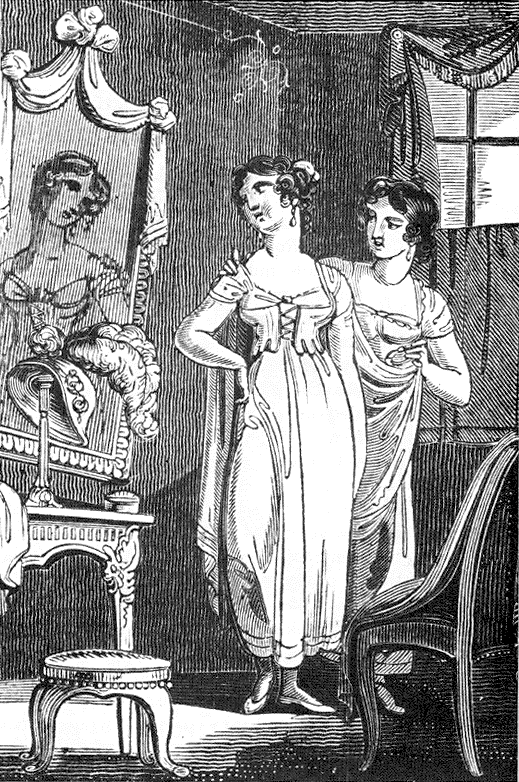 Most of the paintings suggest that she wore very little under the gowns, and certainly no heavy stays! 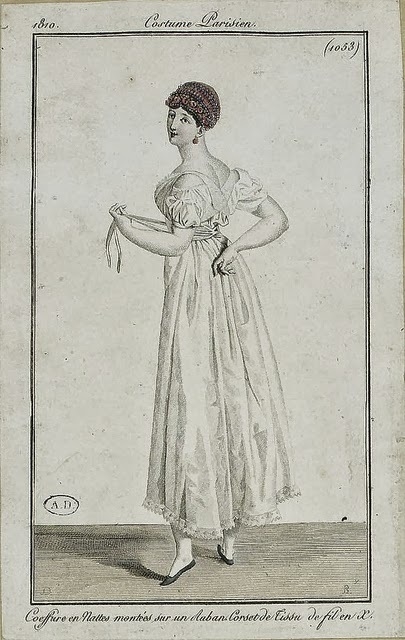 However, since the Museum would be introducing Josephine to an audience of 21st century people, including children, we preferred not to display all her “charms.” Instead, we discussed what sort of underpinnings would provide our Josephine with a period-correct shape without detracting from her sheer gown. A fashionable silhouette begins with the right underpinnings. For Victoria, who already had Josephine’s tall, slender build, we chose short stays. 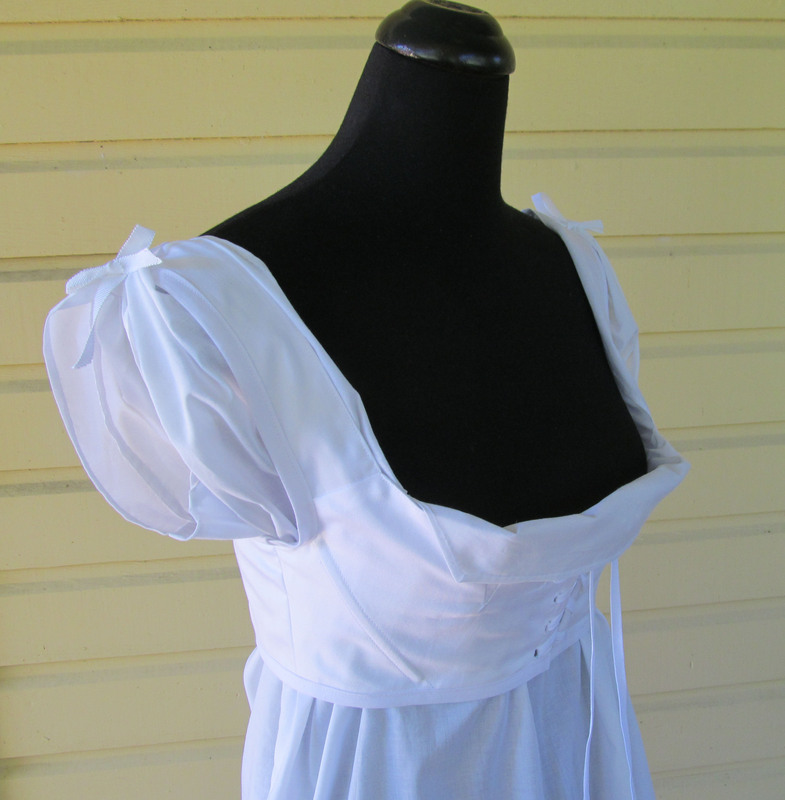 My research showed me images of the types of stays that were worn; I adapted a pattern to suit our Josephine and give her the low neckline and snug fit she would need for her performance. 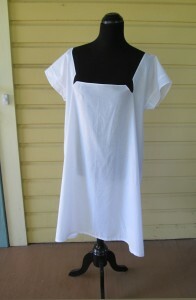 To wear next to her skin, under the stays, I made a thin cotton shift with a distinctive neckline. 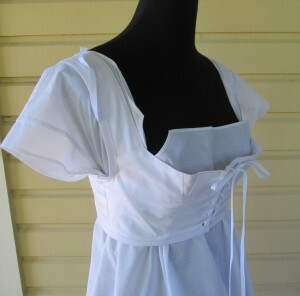 Some period examples have this “slashed” feature; the flap could be lowered over the top of the stays to hide rough edges and any fastenings. I hand-hemmed the stays so there would be no distraction from modern finishes to spoil the illusion of 1804. The dress we designed for Josephine would be sheer cotton voile, trimmed with faux-gold crocheted lace to hint at the opulence of the original. She would wear it over a more opaque white cotton sleeveless underdress, giving her an air of mystery while maintaining some modesty. 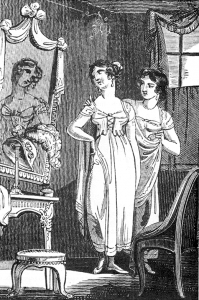 The clothing was shipped well in advance of the program, so that Victoria would have time to try on the garments and become accustomed to moving easily in them. The Museum staff did note that the back of the gown was very tight and pulled a bit as she moved; there was still time to make the needed alterations for a perfect fit. Finally, the ensemble was complete! Museum photographer Reggie Davis captured this image of “Josephine” to use in publicity for the program. 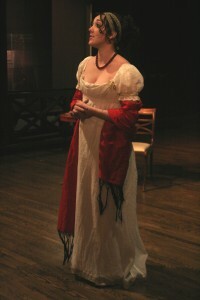 When the program was ready, American audiences were able to “meet” one of the most famous women in European history, portrayed by a skilled interpreter, on a stage set by thorough Museum staffers, and clothed in replica garments from Lavender’s Green Historic Clothing. Interesting project, indeed. Why did the museum decide to do this program–do you know? Did you know that Josephine’s inventory was published? I copied all the pages having to do with clothing. Of course, she had so much other stuff, too! Ah, I see–an exhibit about Napoleon and the decorative arts. I’ve seen a couple of similar exhibits–what cool stuff! And she’s off!!!! Good job! My friends and clients are so SMART! LOL! Months later I’m responding to this…apologies, Kay! 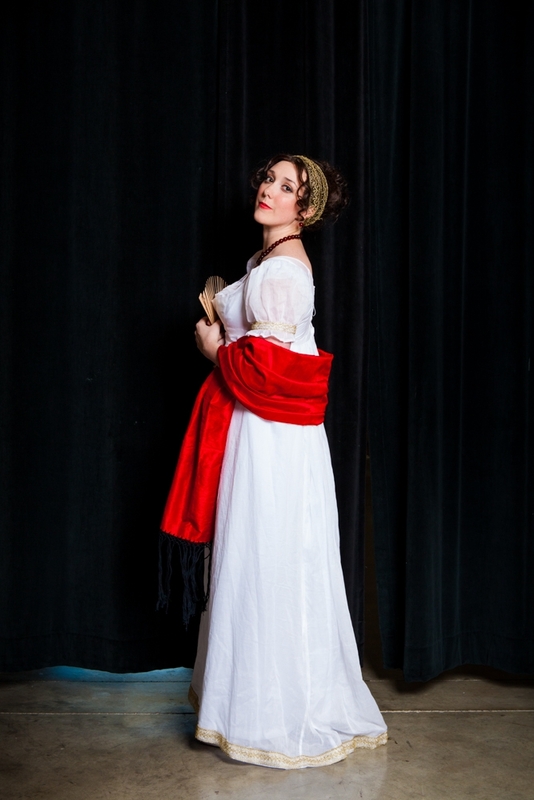 Victoria continues to present Josephine Bonaparte. The interpretation was indeed created for a traveling exhibit, “The Eye of Napoleon,” which the Frazier History Museum had from October 2013-March 2014. The artifacts were all from one man’s incredibly impressive personal collection. The exhibit focused on Napoleon’s interest in art and design and how the pieces served as gifts, propaganda, and representations of taste in his time. 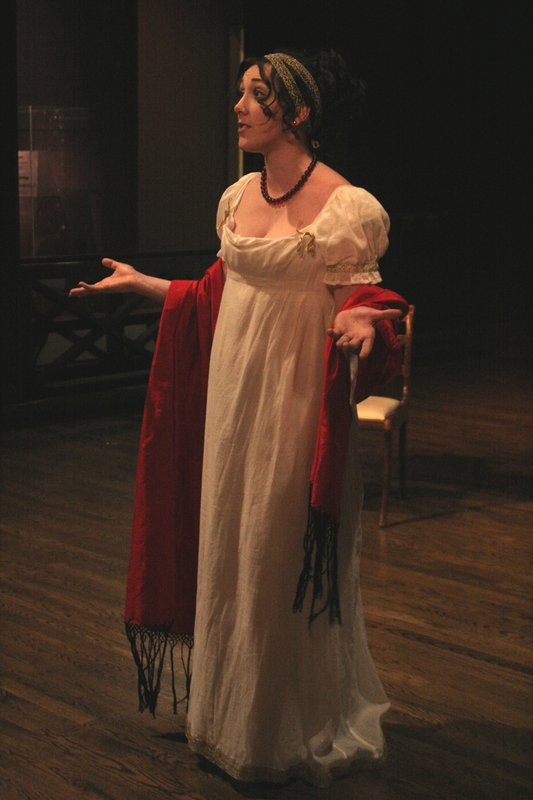 Our historic interpretations are short theatrical performances that “bring history to life,” and are presented by a team of professional actors who research, write, and perform their own scripts. We use primary sources as much as possible in order to give as accurate an impression as possible of the time periods and the experiences of the people we portray. Historic interpretations have been part of the Frazier Museum experience since we opened in 2004. We’ve produced over 100 interpretations in our first 10 years and continue to develop new scripts and interactive presentations, particularly aligning with our Education programming and temporary exhibits. Our other historic interpretations include: Annie Oakely, Colonel Robert Gould Shaw, Catherine the Great, Wilhelm Tell, a Buffalo Soldier, The Reno Gang, Confederate soldier Sam Watkins, Sybil Ludington, Molly Pitcher, Dolley Madison, an American soldier from the Battle of Little Bighorn, an English archer from the Wars of the Roses, Stephen Decatur, Clara Barton, Sic Semper Tyrannis: The Life of John Wilkes Booth (a longer 3-person performance), an American suffragette, Niccolo Machiavelli, day-in-the-life presentations for kids, several storytelling performances for families such as The Legend of Sleepy Hollow and Viking Legends, as well as combat demonstrations with reproduction swords and other hand-to-hand weaponry. We had an exhibit about pirates a few years ago and our entire department was involved in a 30-minute production of Treasure Island which we presented in our rooftop garden, complete with live black powder gun and cannon fire. Empress Josephine was one of those interpretations created for a temporary exhibit, but people loved it so much we kept it on even after the exhibit closed. Why present Josephine? Well, she was Napoleon’s (first) wife and was with him during his rise to power. When you think of Napoleon, you can’t help but think of Josephine. She was a passionate, dynamic woman and a great subject to portray. We aim to both entertain and educate with our performances and give people a chance to ask questions if they want to know more. I hope that gives you some idea of what we do. If you’re ever heading to Louisville, be sure to visit us! 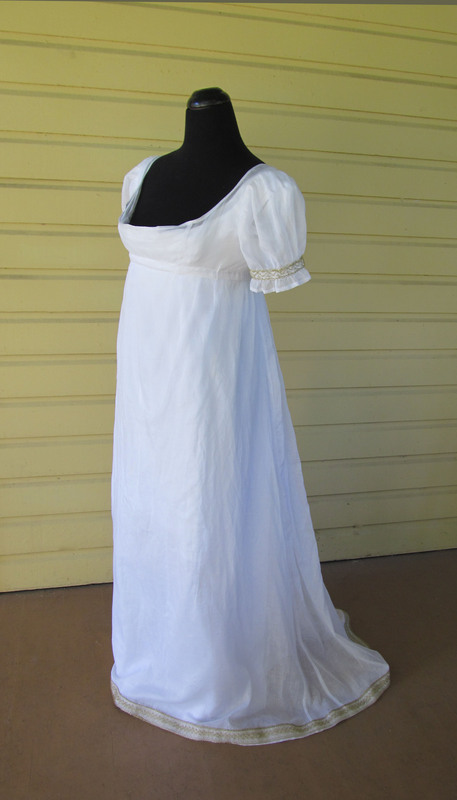 Thanks again, Kay, for your beautiful work on Josephine’s clothing!